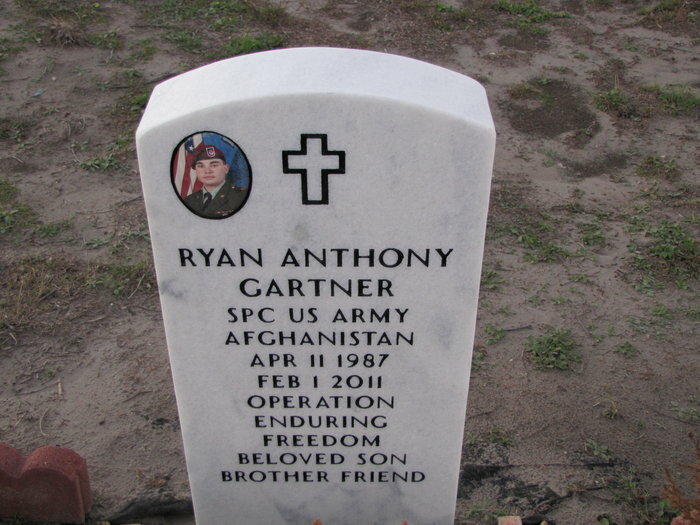 Died: February 1, 2011 in Operation Enduring Freedom. Unit: 201st Military Intelligence Battalion, Fort Sam Houston, TX. Gartner, 23, died Feb. 1 in Afghanistan after being shot in a noncombat incident days before his unit was to end its deployment, military officials reported. Gartner was an interrogator in the 201st Military Intelligence Battalion, 470th Brigade. The unit was training Afghan government officials in interrogation techniques. "This type of work is highly classified, which is probably why Ryan Gartner was reluctant to talk about his work with his family, and why the circumstances of his death will probably never be made public," Gartner's obituary stated. Gartner was born in Corpus Christi and spent part of his life living with his father and stepmother in Dumont, N.J., where he attended high school before enlisting. Gartner's father and stepmother in New Jersey said he eagerly awaited a discharge. Several of his friends died in Afghanistan and he had grown weary of deployment on his second tour, his father, Irvin Gartner, said. Gartner's body is expected to arrive at Naval Air Station Corpus Christi at about 10 a.m., military officials said. His family and an Army honor guard will be there when the chartered aircraft arrives. The Patriot Guard Riders and the Aransas Pass Police Department will join the procession to Veterans of Foreign Wars Post 2932 in Aransas Pass for visitation. Services are Saturday. CORPUS CHRISTI — ARANSAS PASS — Army Spc. Ryan Gartner of Aransas Pass was remembered Saturday as a quiet, dutiful soldier who was always willing to lend a hand. "The thing I choose to remember is his quiet way of smiling, a giant ear-to-ear grin, and his desire to help others," one member of his platoon wrote. 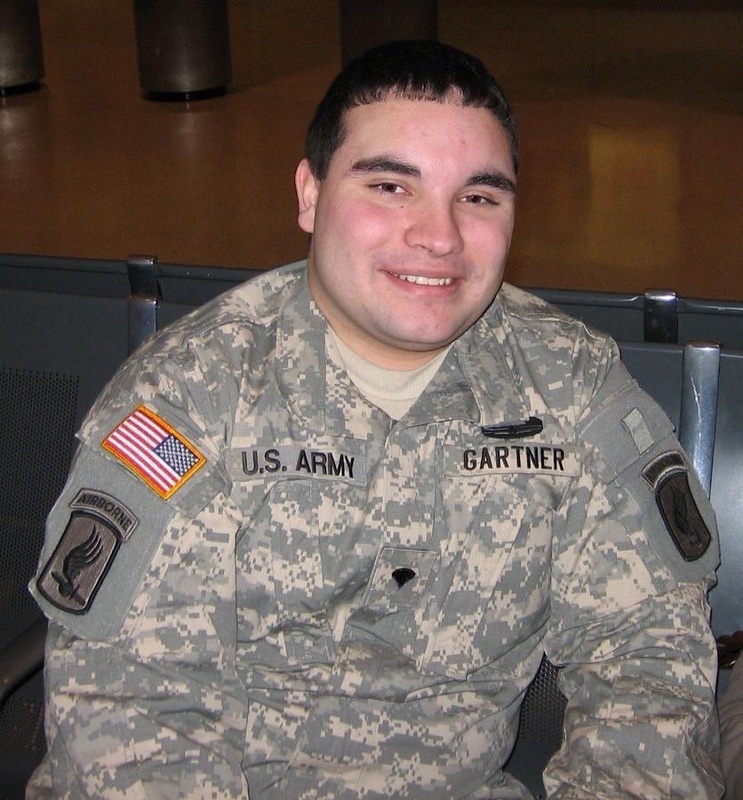 Gartner, 23, died Feb. 1, two weeks before he was due home, after being shot in a noncombat incident, the Army reported. The Army's Criminal Investigation Command has not released details. About 100 soldiers who wanted to attend the funeral were snowed in on their return from Afghanistan, said Sgt. 1st Class Travis Thornton, the platoon's leader. They had a memorial for him in Afghanistan. Brig. Gen. Manuel Ortiz read from their letters during a Mass at St. Mary Star of the Sea Catholic Church. "He could be sarcastic," one letter said, drawing laughter from Gartner's family, "but he was funny. He might grumble, but he was always there for the ones he cared about ... Even when the situation was serious, he would ask, 'Why so serious?'" Thornton, who worked with Gartner for two years, started a workout program with Gartner after the soldier told him he wanted to be in better shape. Thornton said he made it hurt, but Gartner stuck with it. The platoon sergeant stood at attention and offered a long salute to a portrait of Gartner placed beside his casket at the front of the church. He turned and embraced Gartner's mother, Caroline Oley of Corpus Christi. A small choir sang hymns in English and Spanish. Gartner spoke and wrote in both languages at age 4, family members said. The Rev. Roy Jacob Kalayil said although he didn't know Gartner personally, "What I do know is that Ryan was playing the big leagues when it comes to the things that matter. He had chosen a life of sacrifice." Nearing the end of his second tour, he had mourned the deaths of several friends in Afghanistan and was ready to end his military service, his family said. He considered entering the family jewelry business. On Jan. 22, he sent his belongings to his mother. Patriot Guard Riders. Ortiz gave a flag to Gartner's father and stepmother, Irvin and Patricia Gartner of Dumont, N.J. After two soldiers removed the flag from Gartner's casket, Ortiz gave it Oley. "This flag is presented on behalf of a grateful nation and the United States Army for your beloved son, Ryan, honorable and faithful," he said.